Most of us think we can write. Most of us are wrong. If that’s you, then help is at hand. 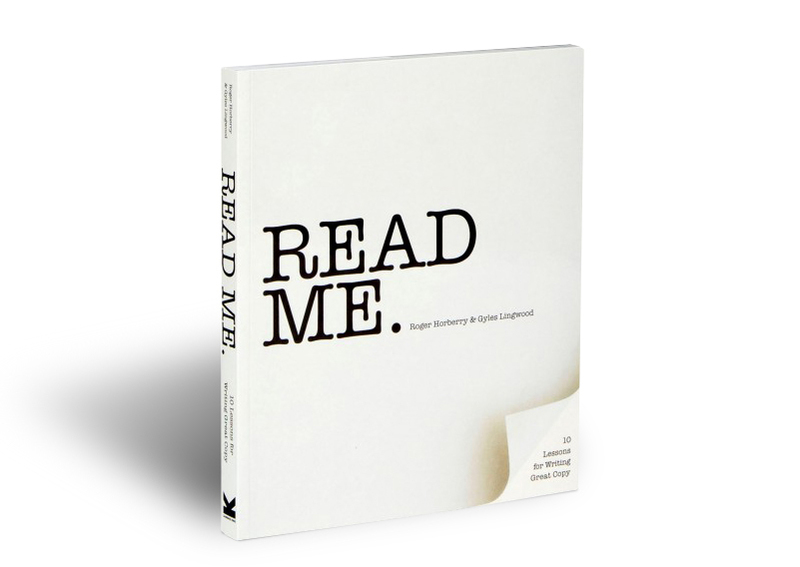 Read Me is a complete course in creative copywriting led by Roger Horberry, an award-winning brand copywriter, and Gyles Lingwood, Principal Lecturer on the University of Lincoln’s Creative Advertising course, one of the UK’s top advertising degrees. Their combined knowledge and experience makes Read Me an essential resource for any ambitious copywriter. Each chapter is a self-contained lesson on subjects ranging from tone of voice to storytelling, branding to audience engagement, and meme-making to effective messages. Read Me also includes detailed contributions from 17 of the world’s smartest commercial writers, and practical exercises to help you pump up your powers of persuasion. The result is a high-energy ride through the world of creative copywriting that will help you craft persuasive, brilliant and effective messages for print and pixels. My copywriting career began at 9.00am on 13 August 1990. Since then I’ve written about everything from finance to fireworks and telecoms to teabags, producing ads, brochures, websites, presentations, think pieces, brand personalities and so on for clients big and small in the UK and abroad. As well as actual writing I also run copy workshops and guest lecture at the University of Lincoln and elsewhere. I’ve published three previous books – Brilliant Copywriting (Pearson, 2009), Sounds Good on Paper (A&C Black, 2010) and 100 Lessons on the Meaning of life (Visual Aids Publishing, 2011). Gyles Lingwood is Director of Education (College of Arts) at the University of Lincoln where, amongst other things, he teaches on the highly regarded Creative Advertising course (that he created). After graduating from the Birmingham Institute of Art & Design he worked in central London for a variety of advertising and design companies. Gyles’ work has been featured in the national design press and has won a number of awards including D&AD, the British Interactive Media Association and the US Creativity Awards. His students are regularly successful in national/international advertising competitions, including D&AD and YCN. He has a distinction in MA Design: Visual Communication, is a Senior Fellow of the Higher Education Academy and regularly undertakes advisory roles in the area of practice-based arts higher education.